Shopping, dining, or relaxing, BWI has facilities dedicated to satisfy and surprise you. Airports are sometimes thought of as simply transit points between destinations, a necessary spot on the map that can offer mindless waiting at best, and grueling lines and inconvenient delays at worst. Though not all airports are designed with pure pragmatism in mind, and the Baltimore-Washington International Airport is taking things to the next level. They offer a diverse array of dining and shopping experiences for everyone who has time to kill or needs something immediately as they dash to their flight. Travel can be rigorous, and BWI’s facilities nurture and strengthen travelers’ bodies and minds, something we at InMotion think is an important contribution to the lives of travelers everywhere. Read on to find out exactly what makes this marvel of modern air transit so special. There’s a lot to be said about BWI, and we decided to start out with their fitness and wellness facilities. BWI is equipped with a fully-functional gym by Roam Fitness that offers cardio equipment, free weights, and private shower rooms. The facility also offers rental workout equipment that will keep you from having to take up precious luggage space in order to pack your own, and it’s located behind security so that you don’t have to worry about lines to schedule a workout. In addition to the gym, BWI has two loops in its main terminal that serve as its Cardio Trail, with each loop taking 20 minutes to complete. The NY Times noted that walking around is a great way to get in your exercise while traveling, and BWI has made it easy for you. These are perfect for those moments when you just need to get up and move around for a while to work off all that pent-up energy spent sitting for hours on end. It’s completely free as well, so you can break a sweat without breaking the bank. If you’re looking for places to relax and rest away from your weariness, BWI comes with two (two!) spas and wellness centers that provide massages, aromatherapy sessions, and saunas. This level of luxury can be a godsend for travel-worn souls, and we think that it can be the kind of experience that can transform a negative experience into a happy memory of relaxation. In need of a private respite? The airport also has a meditation room, a small space with simple furnishings, but dedicated to providing a place for people to rest their minds and quiet their thoughts in the midst of fast-paced travel. 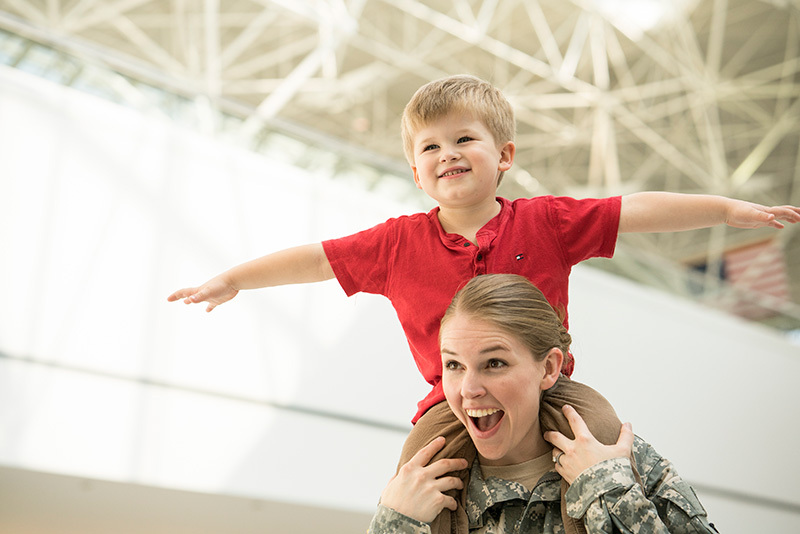 Just as it’s possible for airports to mean more for the average consumer, airports can take on vast importance for those serving in our Armed Forces. An airport can be the site of a tearful goodbye, or the site of an equally-tearful (but joyous) welcome home. With this in mind, Baltimore-Washington International has designed the United Service Organizations International Gateway Lounge befitting the respect these men and women deserve, with a fully-equipped snack bar, a family room with toys and cribs for children of military personnel, and a tv lounge with a 72-inch screen and an impressive collection of movies to select. There are also sleeping rooms for exhausted travelers with a wake-up service included, domestic and international phones. 99% of the armed forces stationed in Europe, Southwest Asia, and the US pass through this terminal to travel to their posts and to come back home, and BWI has clearly taken that responsibility seriously with their substantial array of amenities for the military personnel and their families. A top shopping priority for many service members is a working SIM card for their overseas travels and you can pick one up right at the airport from InMotion. If you find yourself heading to the USO lounge, rest easy knowing that the people in charge take your comfort seriously. One thing that airports have become known for is their amazing selection of luxury retail and dining. As consumers come to expect more and more out of their airport experience, businesses have risen to the occasion to provide the kinds of high-end products and services that can be accessed through airports. Whether you’re a top executive of a business or on a lower rung of the corporate ladder, now that these shopping spots exist they're for all of us to enjoy. Vino Volo at BWI is one such experience, as a wine bar that serves to cater to tastes that span the spectrum of tastes and preferences they can completely shift the tone of traveling from a necessary burden into something to look forward to. They have an interesting approach since they know that they are situated within the airport, so they offer the traditional experiences of wine by the taste, bottle, and glass, but they can also provide wine catered towards your flight, an added twist that nuances the experience towards your travelling needs and desires. You can find them near gate A7 at BWI. Another store that will land you in the lap of luxury is Fire and Ice, a retail location that offers some spectacular gemstone and mineral objects for sale. Their jewelry is absolutely stunning, with onyx, rubies, sapphires, and opals featured in their accessories, but they also have some truly outstanding art from Africa and fossils from ancient creatures found around the world as part of their selection. See them at gate B1 for more of their museum-quality wares. As the number one airport electronics store in Baltimore, InMotion is ready to fulfill all of your tech needs while you shop through BWI. You can find our InMotion locations at gates D4 and A5, and our staff will be happy to help you find the best option for you from Bose headphones, official Apple products or even a T-Mobile Tourist Sim Card. Looking for something else for your trip? You know that when a company patents their earbud design, it has to be good. With Klipsch’s history of delivering outstanding quality through their loudspeakers, they’ve brought that engineering ability and combined it with their patented earbuds designed for comfort and wearability. The result is a musical experience that is unforgettable due to the synthesis of these two essential elements of any listening experience. These would be perfect for finding your peak performance at the gym, or finding your zen in the meditation room. Klipsch R6I In-ear Headphones come with a carrying case, clothing clip, and four extra pairs of earbuds, a single purchase is all you’ll need to be completely set for unbelievable quality anywhere you go. Even in this day and age when the internet has taken over so many parts of our lives, access to the internet is still not available everywhere. Despite its apparent ubiquity, the internet is not universally accessible by any stretch of the imagination, and that can be a real problem when our jobs and social relations can depend on access to the internet. In order to make sure that this problem doesn’t interfere with your life, the good people at Skyroam have developed a line of portable WiFi hotspots for your travels, and Skyroam Solis Global WiFi Hotspot/PowerBank could be the perfect companion to your internet-starved adventures. Offering unlimited data that you purchase through a day pass, you’ll get as much data as your heart desires for 24 hours. Take note, after your first 500 gb delivered on a 4G signal, your data will then travel over a 2G or 3G network, so plan your data usage accordingly and prioritize what you work on first. Added bonus? The Skyroam also serves as a powerbank charging your devices while you surf the net. Devices like this are invaluable in a pinch, and if you happen to travel frequently to internet-free areas, then the Solaris could be a godsend. We doubt you need us to tell you how amazing Bose products are, but they deserve to be recognized whenever possible: from their absolutely stellar track record of supreme audio products, to their ubiquitous support from consumers around the world, Bose is a household name for the best in the speaker business. With the Soundlink Micro Bluetooth speaker, that reputation for outstanding quality is packaged in a durable, waterproof wireless speaker that can provide 6 hours of music for all of your needs while you travel or even in your hotel room. BWI is a quality representation of what airport terminals can provide to fliers in their services and experiences. With a concentrated effort to meet the needs of their users, through both physical wellness and improved retail opportunities, BWI has set an example for how to provide travellers with a memory they’ll be happy to visit in the future, and a location they’ll look forward to visiting in their travels. At InMotion, we are proud to be a part of the Baltimore experience.